Paddle sports (and ocean sports in general) have huge synergy between disciplines. In this day and age it’s common to find enthusiasts riding various craft. Meet John Galilee. John and partner Anne are avid outrigger canoe pilots, as well as being into all manner of watery activities, and run a business revolving around OC. We caught up with John to get the low down on his paddling shenanigans and find out more about a sport that’s becoming increasingly popularity in the UK. When did you first discover OC and what made you get involved? About eight years ago I became interested in the catamarans and outrigger sailing canoe designs of James Wharram. He uses traditional Polynesian concepts in a modern context. Then my partner Anne came across the sport of outrigger canoe paddling whilst visiting relatives in New Zealand. We were both excited about it. It looked like a really cool way to get out on the sea. We had to get hold of one each. Before long Anne had started to import and sell OC1s and OC2s made by Allwave in Italy, the biggest European manufacturer. Looking back it was a crazy venture into a sport that we didn’t know existed, and to be honest didn’t understand anything about. 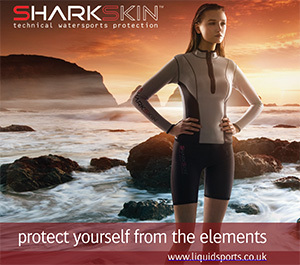 It’s been a life enhancing journey that has kept us involved with an ocean sports lifestyle. We’re fit and stoked into our 50’s and hopefully this will continue for a long time. It’s pretty easy to get started, especially if you have previous paddling experience of any kind. You might get wet your first time because it will be quite tippy on one side. On the other side it’s very stable, so you can have a rest quite easily. A one man outrigger canoe or OC1 is a sit-on-top design so if you fall in you just flip it over and climb back on. Like any paddle sport improving your technique will be never ending. For the record my perspective is that of the weekend paddler – good enough to have a lot of fun but not a coach or purveyor paddling technique. Talk us through your equipment and what makes it so good – are you using anything specialist for instance? An OC1 is about 21’ long and uses very light vacuum bagged foam sandwich layups to keep the weight down. It’s a modern take on a simple ancient design concept OC’s use a float (ama) on one side to provide stability to a narrow hull. It’s a very fast shape that can handle big seas. OC1 designs came out of the Hawaiian Islands and have a foot operated rudder to make steering easy whilst the Tahitian equivalent, the V1, is rudderless. They also differ in length, rocker and amount of vee. The V1 designed for Tahitian lagoon conditions is faster on the flat whilst the OC1 is faster in open water. Paddles are single bladed and can be all wood, carbon or a hybrid of both. Switching sides regularly keeps your muscles fresh. In sheltered waters in the summer all you need is a canoe, a paddle, board shorts and T-shirt. At the other extreme, in wilder conditions or in the winter, we’ll wear wetsuits, a PFD and a leash. We’ll also carry smoke flares and a handheld VHF. The books of Steve West are a great place to find out more about the design, history, culture and technique of outrigger canoeing. What’s your most valuable piece of kit – in terms of a tool you couldn’t do without? Other than the canoe and paddle our VW T5 van gets us and our kit to the beach and away on trips. It gives us somewhere to sleep, keeping it fun and affordable. Do you paddle flat water or is mainly bump hunting? Someone said: ‘I’ve never seen a bump I didn’t like’ and I tend to agree. You can find bumps anywhere. Be it wind bumps, swell, tidal overfalls or boat wakes. It’s all good practice. Sprint racing in V1 canoes on flat water is pretty good fun and we sometimes paddle on the Thames at the Royal Outrigger Canoe Club. Surfing an OC looks incredibly fulfilling. What are the main skills you’ll need for this type of OC paddling? Finding the right kind of waves is important because OC1s aren’t designed to withstand heavy breaking waves. A background in surfing or other ocean sports helps. We seek out the waves that pick up then back off a bit. You’ll generally be going straight in on the wave or trying to keep a steady angle along it. Burying the nose in the trough is best avoided because you’ll lose all speed and steering ability. You sometimes find yourself waist deep in water, but if you’re going straight enough the nose will usually pop out again. ‘Flying the ama’ is fun and looks pretty cool. The drag of the ama is greater with your extra speed on the wave, so balancing it above speeds you up and enhances manoeuvrability. You’ll stay on the wave longer. Surfing a rudderless V1 is more difficult but the simplicity of it can be really satisfying. Do you paddle downwind or is it just surf? There are lots of aspects to OC1 paddling: downwind, surfing, sprint racing, distance racing and just paddling for the fun of it. Then there are all the different sizes of OC. We do the lot. My own focus is one man canoes and that’s what I’m mainly talking about here. We downwind when we can. If yes to the above what are your favourite downwind runs? Chichester and Langstone Harbour (Hampshire, south coast) provide some decent DW runs that are safe when it’s ridiculously windy. Which type of weather chart do you look for when planning an OC session? Is it tricky to nail it? If there is a long period swell then different sand banks will work at different states of the tide. Shore dumps are a no no, so sometimes it’ll be good but you can’t get in. We’ll score great surfing waves a few times each year. If we lived nearby we’d get it a lot more. Webcams and Facebook pages provide good real time info and allow us to get a higher hit rate. How often do you travel to paddle OC? Are you confined to the UK or do you head overseas? I’ve raced around Giglio Island, Italy, in the Allwave Cup, raced OC6 in Cherbourg and Toulon. Anne has paddled the Molokai in Hawaii. I also paddled in Hawaii when I went to support her. And, of course, we’ve been all over Britain. Got any plans to hit foreign destinations for OC paddling? If so where you planning on heading? There are so many cool places to go to but I don’t have any plans at the moment. It may sound unadventurous but I’m happy enough paddling around the UK at the moment. Is it tricky travelling with OC kit? What ways have you found to lessen the strain? Not too bad. You need to take your car or van of course. In terms of idols who do you look up to in the OC paddling world? What about sports in general – any heroes there that provide inspiration? My own favourite is Manutea Owen. I love the way he talks about paddling. Then there’s Nappy Napolean, a real legend, who I was lucky to meet in Hawaii. Dave Kalama has been a hero since my early windsurfing days. 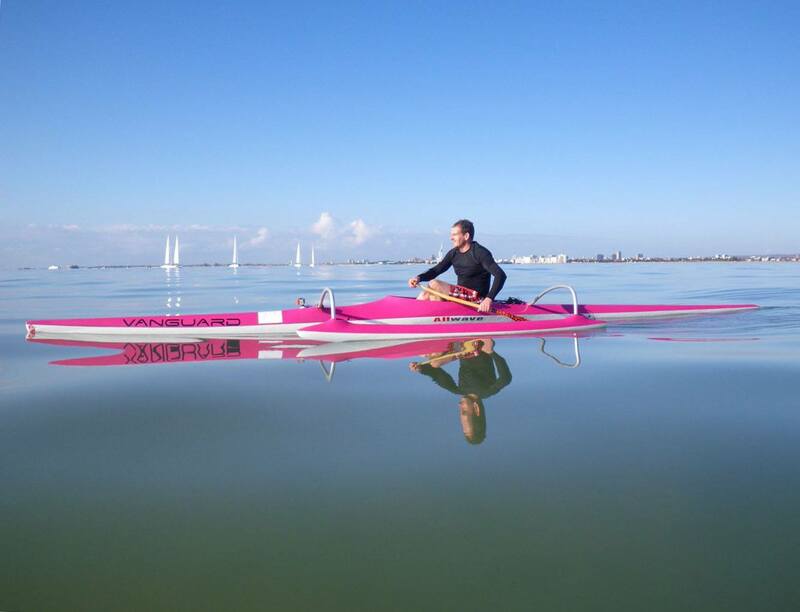 In the UK Glenn Eldridge is definitely an inspirational multisport waterman. I also watch a lot of MotoGP. All the riders are amazing but Valentino Rossi is something else. Tell us what you think of the OC scene in the UK. Do you think more could be done to make it attractive? The OC scene in the UK is surprisingly big, with new paddlers coming in all the time. The number that paddle and race regularly in all conditions on the sea is much smaller and more spread out, so as OC1 paddlers we’re very fortunate that we can often race with SUP and ski paddlers. The SLSGB ocean ski paddlers, for example, have an excellent ocean racing series, some of which we can enter. The explosive growth in popularity of stand up paddling has reached a point where some SUP paddlers are becoming aware of the roots of their sport and keen to use their paddle skills and ocean skills elsewhere. 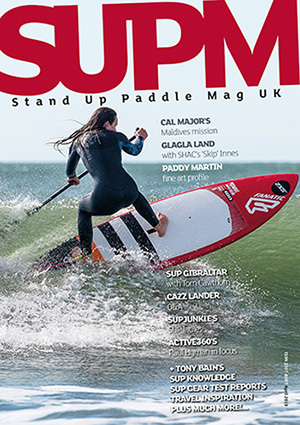 SUP has boosted the popularity of downwind paddling enormously and SUP, OC1 and Ocean ski riders can get together for downwinders. The Round Hayling Windsurfing Race has welcomed OC and it has become a fixture on the calendar. Glenn Eldridge hosts incredible coastal voyages. The Coast to Coast from Penzance round Land’s End to St Ives and The Celtic Crossing race from the Scilly Isles to Sennen Cove are noteworthy. OC6 clubs regularly get together for meet-ups in Studland Bay that are really popular. There’s a whole lot of OC6 paddling going on, which I’ve hardly touched, but I’ll leave that for another discussion. So all in all, we’re getting there. How would you encourage others to take up OC paddling? Give Anne a ring or email her at info@outrigged.co.uk. She always has demo canoes ready to try as well as new or ex demo boatss in stock. Or contact one of the OC6 clubs who have regular training sessions that you could attend as well as demo days. Once started you’ll find yourself welcome at any OC club in the world. What’s your biggest tip for anyone considering OC as a sport? It’s a bit different, but if you think it’s for you then it probably is. Have a go and find out for sure. What about other paddle sports – practice any of those or just OC? I like to SUP, surfski, surf and swim (hands are paddles after all) a bit. There’s a huge cross over with SUP. Many top SUP paddlers are top OC paddlers too. Think Danny Ching, Dave Kalama and Steeve Teihotaata. This is true in the UK too. Ryan James, Pete Holiday and Ollie Shilston excel at both. I windsurf in the autumn and winter so I’ll often take an OC1 to the beach with me – just in case. Who are your paddling partners? Do you have a big crew or just a couple of other OC nuts? Mostly with Anne for OC1 paddling. To get the conditions you’ve got to be impulsive and go when it’s good and it’s not always easy to arrange with others. 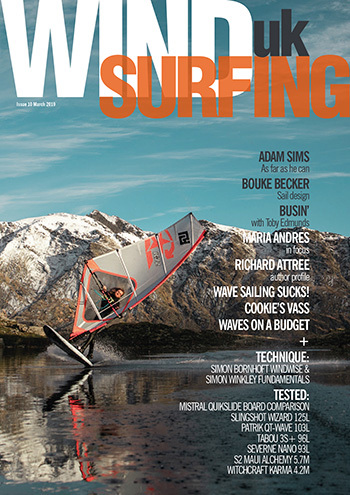 Last winter we started to hook up with SUP paddlers and ocean ski paddlers for downwinders. It’s pretty much the same sport. Anyone globally you’d like to paddle with? No one in particular. When Anne raced in Hawaii we turned up randomly at OC clubs and paddled with them which was pretty cool. Thanks to everyone at the UK’s OC clubs: The Royal Outrigger Canoe Club, OCUK, Paddlesport Racing Canoe Club, Bournemouth Outrigger Canoe Club and Ocean Sports. Most of all thanks to Anne, who’s always ready to paddle out into the waves with me, however cold it is. And thanks to you guys for the opportunity to promote OC1 paddling in the UK and our canoe business.